CD review: "King of Zydeco"
Great playing, but where's the info? This review first appeared in the September/October 1991 issue of Living Blues magazine. Given the paucity of information in the liner notes and the complete lack of any recording information on the packaging, this is one CD you will either buy for the music or not at all. There are, simply, no recording dates, no sidemen, no solo credits listed anywhere on the album. In an ironic twist, the only credit listed is for the liner notes by Paul Harris: those notes were taken from Arhoolie F1031, which doesn't contain any of the songs on this album. Further confusing things, Arhoolie also has an album titled "King of Zydeco." 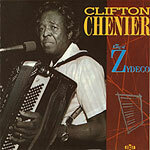 Regardless of the above inanities, "King of Zydeco" is an interesting collection of Clifton Chenier songs, made the more so by the inclusion of covers of non-zydeco songs such as Charles Brown's "Driftin' Blues," Little Richard's "Tutti Frutti" and Ray Charles' "What'd I Say." Still, the title of the album begs the question of why include non-zydeco R&B songs. However, no matter the musical genre, this is classic Chenier: swooping, rollicking, hollering music. "Tutti Frutti" may not have the same manic energy as the original, but it remains a very swinging version. It should be pointed out, though, that stellar and uncredited solos on tenor saxophone and guitar only add to the frustration with the liner notes. "Driftin' Blues" is more interesting than "Tutti Frutti" in that the intro is zydeco-ized, while the vocal and main verses are performed as a straight blues. Another excellent guitar solo may cause the listener to again pore over the liner notes in fruitless hope of enlightenment. "What'd I Say" is a pretty hopping bit of R&B  and by now, the listener knows better than to look for solo credits. The zydeco material is, as should be expected, far more rewarding than the R&B covers. "My Baby She's Gone" is typical Chenier (typically good, that is). The arrangement uses traditional call and response, with the horn chorus answering Chenier's lead. He plays his accordion like an organ here, incorporating it into the rhythm as well as carrying the lead melody. "Old Time Waltz" continues the traditional sound, with a New Orleans-style group improvisation. "Zydeco Boogie," "Zydeco is Back Again," "Mama Told Papa" and "Tired of Being Alone" are similarly excellent zydeco songs. The quality of the recording is very good throughout; the performances likewise. Still, given the inexcusable lack of accompanying contextual information, i tis hard to recommend this album to any but absolute beginners seeking an introduction to Chenier's work  and even then, any of Arhoolie's releases would serve better.